Welcome to National Preparedness Month! This is the first of many giveaways I’ll be running this month, and also a continuation of the Book Bonanza giveaways we have been doing over the summer. And, it’s one of my personal favorite books because I wrote it! This week we’re giving away a copy of Food Storage for Self-Sufficiency and Survival. For my full introduction to this book, check out this post. If you’re getting started with food storage, and even if you’ve been doing it for a while, there is something in this book for you. I also had the opportunity to be interviewed this week by Donna Miller from the Surviving on Shoestrings Radio Show. We had a fabulous time discussing food storage and what’s in the book. Take a listen here! Enter below for your chance to win a copy of Food Storage for Self-Sufficiency and Survival. Very excited about the giveaway, looks like a great book! This book is on my wishlist – it has great reviews and I look forward to getting a copy! I like books that I can hold in my hands! 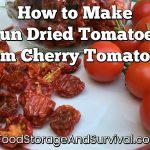 I found this contest on Food Storage and Survival blog. Looks like a great book, can’t wait to check it out! I learned about this from my favorite preparedness blog: yours! I found this giveaway on the Food Storage and Survival site. I love books, can never have to many. Building a library of how to books that is shaping our new way of life. Ebooks are ok, but holding a real life book is so much better. If the grid goes down, we will still have access to the information that we need by having the physical book in hand. Thanks for another great giveaway. I like hard copies of good books too. One solar flare and all those ebooks are gone.